784. Fragments from a testamentary inscription. 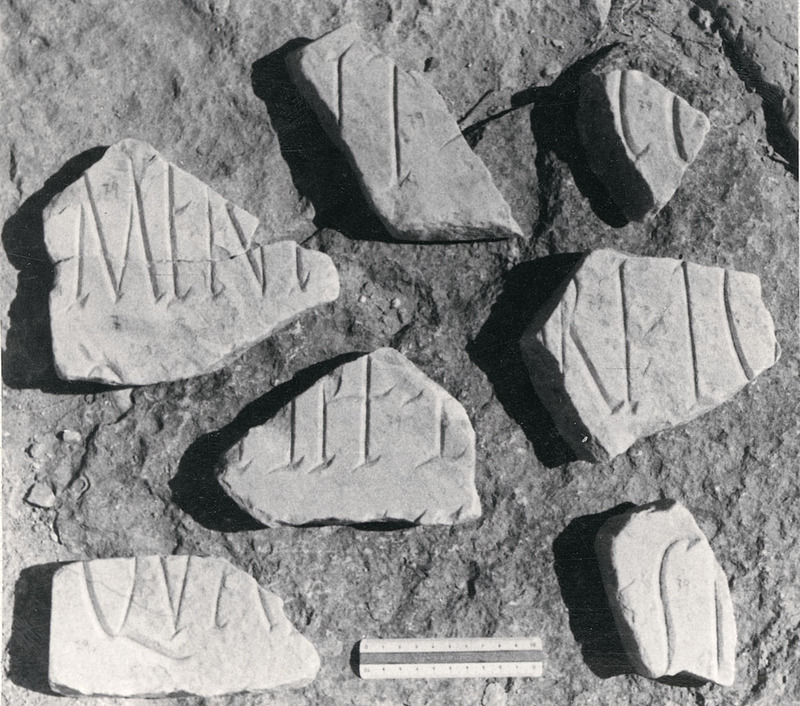 Seven fragments of a marble panel. a) w: 0.175 x h: 0.155 x d: 0.03, left-hand edge. b) w: 0.16 x h: 0.08 x d: 0.03, left-hand edge. c) w: 0.16 x h: 0.11 x d: 0.03, no edges surviving. d) w: 0.15 x h: 0.13 x d: 0.03, no edges surviving. e-g) small fragments. Inscribed on the surviving faces. (a)[·· ? ··] in accordance with the will [·· ? ··]; (b) Which things [·· ? ··]; (c); [·· ? ··] sesterces [·· ? ··]; (d to g) not usefully translatable.